An expanded targeted panel (358 genes), increases the likelihood of identifying actionable mutations in diverse cancer types. Molecular profiling of tumors is performed to identify mutations that accumulate in cancer cells, in particular driver mutations that can serve as treatment targets. Mutations identified in tumors usually include single nucleotide variants (SNVs), deletions and duplications. Identifying and characterizing the mutations in tumors therefore can have both diagnostic and therapeutic applications. The advent of Next-Generation sequencing has enabled high-throughput, low cost, accurate molecular profiling across many tumor types. 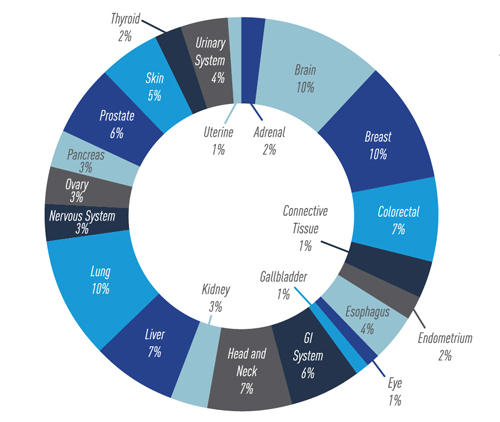 The JAX Cancer Treatment Profile is a targeted panel of 358 cancer related genes known to be associated with various cancers; analyzed using next-generation sequencing. The panel assesses all identified functional variants for clinical relevance, based on associations in the biomedical literature with response or resistance to FDA-approved targeted therapies or new drugs in development. The gene targets are selected for their known association with cancer types in over 20 different cancer primary sites, enabling detection of mutations present in as few as 10% of the cells in the tumor specimen. Evidence of association between genomic variants and potential response to therapy or availability of clinical trials is curated from the peer-reviewed literature, publically available databases, and The Jackson Laboratory Clinical Knowledgebase (CKB). For the 358 gene panel, genomic DNA is extracted from macro dissection-enriched FFPE tissue sections, followed by enrichment of target exons by hybrid-capture (Agilent Technologies). Illumina sequencers generate 150bp paired-end sequence reads with a mean coverage of ≥300X, with a required minimum coverage of 140X for reporting variants. The LOD for variant detection is 10% allele frequency, however, due to the high specificity of this assay; variants detected at 5% allele frequency are also reported. Mutational analysis is performed using the Clinical Genomics Analytical (CGA) pipeline, developed at The Jackson Laboratory (JAX). Formalin-fixed, paraffin-embedded (FFPE) material only. One representative hematoxylin and eosin (H&E) stained slide and 5 to 10 adjacent unstained 5 um sections on uncoated, unbaked slides. We also accept tumor blocks. Any solid tumor, primary or metastatic tissue. The area of highest tumor cell content should be a minimum of 3 x 3 mm. Febbo PG et al. JNCCN 2011;9 [Suppl 5]:S1–S32) NCCN Task Force Report: Evaluating the Clinical Utility of Tumor Markers in Oncology. JAX-Clinical Knowledgebase (CKB) is a powerful tool for interpreting complex genomic profiles, and represents a valuable resource for clinicians and translational and clinical researchers around the world. The FusionSeq™ assay is designed to detect fusions involving one or more of 53 genes known to be associated with various carcinomas, sarcomas and hematologic malignancies. ActionSeq™ is a targeted panel of 212 cancer related genes analyzed using next-generation sequencing. The panel assesses all identified functional variants for clinical relevance, based on associations in the biomedical literature with response or resistance to FDA-approved targeted therapies.